Or… Best Church Service Ever. 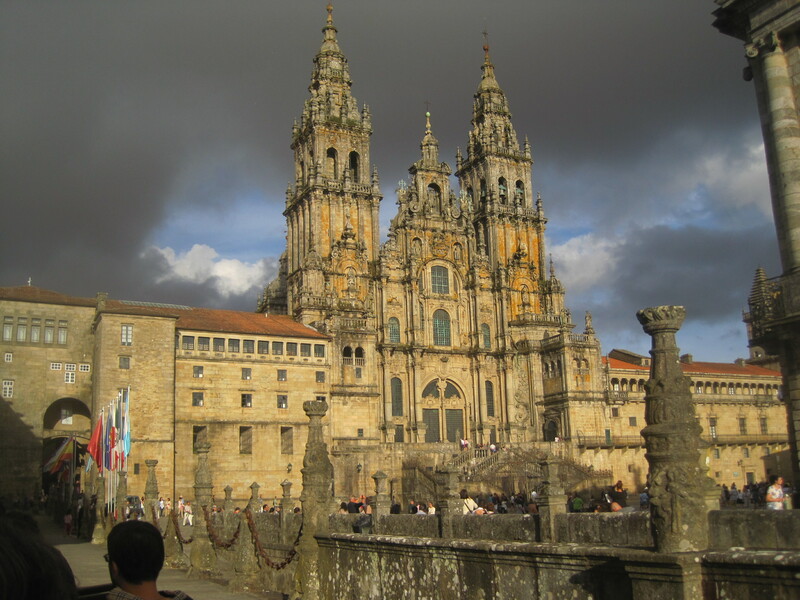 I reached Santiago de Compostela on a Saturday. I honestly had no idea what to expect. As, I explained here (towards the bottom), despite really enjoying the Camino… I decidedly did not enjoy those last 100 or so kilometers into Santiago… the mood changed, the general type of peregrino changed… basically everything changed. For me, the Camino seemed to lose the sense of common purpose and community that it had right up until I crested the hill at O Cebreiro. Once that happened, my lovely companion and I decided to do what it takes to just get’er done… so we flipped from walking more for enjoyment to walking as far as we could every day to get to Santiago as quickly as possible. The final day into Santiago (i.e. the last 20 kilometers or so) was no exception… we were basically speed walking at that point. We’d book it past groups of people singing stupid songs only to walk past them and right into another group of people chanting and singing… it was simply hard to enjoy anything at that point… and that final stretch into Santiago is… well… let’s just say it’s not the most scenic walk on the planet. I had heard from others that had done the Camino before that Santiago itself was pretty anticlimactic (something about the whole “it’s the journey and not the destination” thing)… so I set my expectations accordingly low. And of course I was already not in the best of moods from walking the last couple of days (or that morning for that matter), but I have to tell you, the second I walked into into the square in front of the cathedral my whole mood flipped. It was just something about the place and the people… despite the touregrinos… you could actually feel the joy in the air. I’m not just talking about my own satisfaction of not believing that I was actually here after walking for a month that I felt as an individual, but the joy of the collective…. the combined feelings of everybody who’d arrived (even if they hadn’t walked that far). Maybe it was because I had arrived on a day, in month, that traditionally has large amounts of peregrinos arriving in Santiago… or maybe I was just projecting my own feelings onto the group… but whatever it was, it was definitely a special feeling. My view from the square in front of the cathedral the day I arrived. 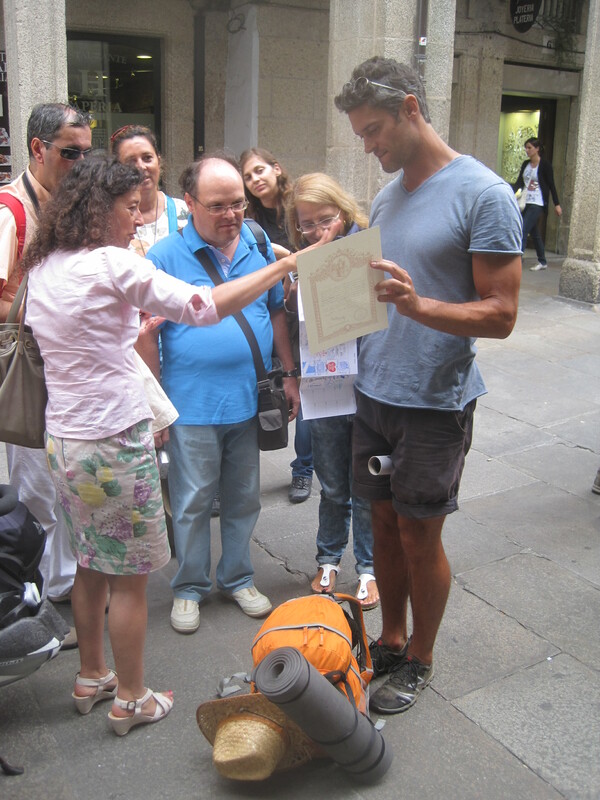 Me getting interviewed by an Italian tour group immediately after taking the above picture. Once compostelaed, I went to explore the cathedral, which is very similar to most other cathedrals (if you’ve seen one in person) in that it was quite large and impressive. The only thing noticeably different about this one was… for lack of a better term… that it looked lived in. And what I mean by that, is that the cathedral was definitely not in perfect condition… there were plants and moss growing on the exterior, faded paint and chipped stonework everywhere, and everything had that look of embedded grime that comes with hundreds of years of candle smoke and people touching everything, etc. And I must say that the lack of perfection actually made me feel at home somehow… it was actually warm and welcoming as opposed to say… the cathedral in Leon (which I had seen about two weeks earlier), which was arguably much more impressive (massive, massive stained glass windows everywhere) and had been beautifully (and spotlessly) restored, but was somehow sterile… the kind of place that makes you want to whisper and walk silently. Not that the cathedral in Santiago made me want to shout, but it was just much more inviting and comfortable… you felt like you actually wanted to stay and sit for a while. Maybe strange that a building could do that… but it definitely did. Being the focus of a major pilgrimage route, the cathedral performs a special pilgrim’s mass everyday at noon. 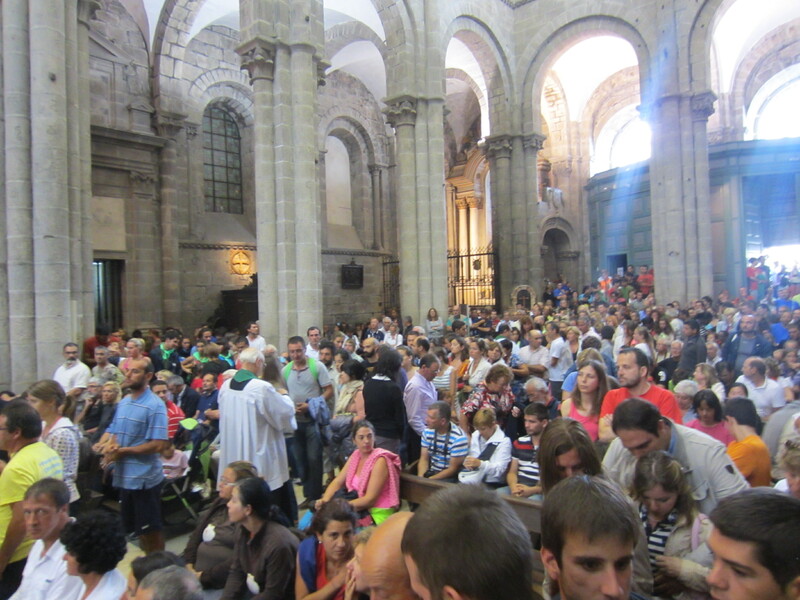 Now, I’m by no means a very religious person, but attending the pilgrim’s mass is part of the Camino de Santiago, so it only seemed proper to go… and, using my impeccable timing, the following day was a Sunday… so I kind of should/have to go right? Right (and for the record, I did want to go). I was told to get there early… but having a lazy Sunday morning (i.e. sleeping in, dilly-dallying with the hotel breakfast, reading the intrawebz, etc. ), my lovely companion and I managed to arrive at 11:30. Oops… the place was packed. Now, keep in mind that this is a cathedral we’re talking about here… not exactly a small building… and it was standing room only… even at 11:30 (the cathedral even has crowd control officers working the floor for just such an occasion). We managed to find a place half-behind one of the columns not too far away (and luckily we both are tall enough to see over the majority of Europeans) and settled in waiting for mass to start (knowing full well that it would not start precisely on time… because we were in Spain after all). A shot of the crowd from where I was standing… in the transept for you all you cathedral architecture buffs out there. At about 11:50 or so, what looked to be about an 80-year old nun approached the main microphone and asked for silence (this, and the actual service, is all in Spanish mind you… which I could mostly understand after being in Spain since May), and she then began to walk the crowd through the choruses of the main hymns that were to be preformed during the service. She, no joke, had an angelic singing voice… the entire crowd (a full house mind you) was absolutely dead silent listening to her sing. She tried to get the crowd to sing along with her, but I think everyone was just too in awe of the spectacle of that voice coming out of such a tiny old lady to actually sing… simply amazing. Now, in terms of the actual service itself, there was not much different from a typical Sunday Catholic mass… the only real unique things being that the priests who completed the pilgrimage were all able to join in the service (so there was about 20 priests in white robes up around the altar), at the beginning one of the priests announced the originating country of all the pilgrims that had received Compostelas the previous day (and I did hear Los Estado Unidos) and during the call to prayer each priest offered a prayer in his native language (I recall hearing Italian, German, French, Portuguese and English of the Irish variety). So nothing exciting enough there to justify my subtitle… but there was just something about the crowd that day… the same collective joy from the previous day in the square was still in the air. Despite being packed in, nobody was rude or obnoxious (everyone was quite and respectful… well, except for one middle-aged German lady who, backpack on, kept pushing her way through the crowd to get to the front through half the service… but she was at least quite… well done lady). And since the crowd was mostly Spanish (and Catholic) the audience participation on the singing and responses was very high. So the collective joy in the (large) crowd, the angelic voice of the nun (over the loudspeaker), the booming pipe organs (in full throttle) with everyone singing and moving together really created a special moment for everyone there… again, I don’t make it to church much myself, but it really was a moving moment (hell… if every service were like this one I’d go all the time). When I said above that there really wasn’t much difference between the pilgrim’s mass and a regular Sunday mass… I was omitting one little thing… which is alright because the cathedral doesn’t actually do this for every single pilgrim’s mass (once or twice a week, but always on Sunday). The Cathedral in Santiago has one tradition that pretty much is the best thing I’ve ever seen in a church service… head and shoulders above anything else… and that’s the botafumiero (insert tasteless priest molestation joke here?). The botafumiero is simply a large incense holder… it’s what they do with it at the end of mass that is most impressive, and instead of describing it I’ll just show you. 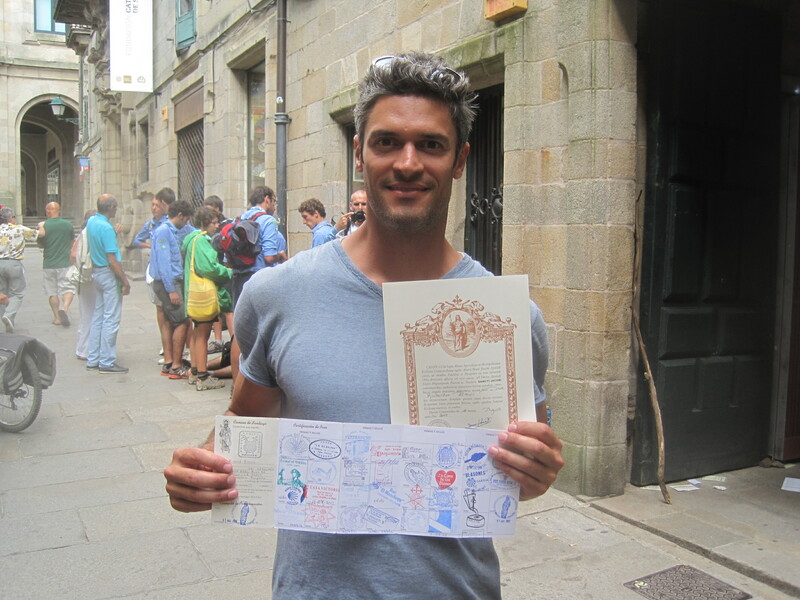 It was one of several highlights during my short stop in Santiago that that helped me commemorate my completion of the Camino de Santiago. I mailed them home (I had the ones shown in the picture, plus received two more certificates when I reached the ocean)… mostly to save space… and I didn’t want them to get ruined either.